Martin Luther College hosts weather data gathered through a Davis Instruments weather center. Data is stored on campus and also shared with Weather Underground, a well-known weather site on the internet. Weather Underground provides free hosting of our current and historical weather data. Because of that they do have advertising on the site. Martin Luther College is not responsible for any advertising found on the Weather Underground site. In Spring 2014, the college was approached by WSI’s United States Precision Lightning Network with an offer to include MLC in the data gathering network. The offer was to provide a lightning sensor as long as we did the installation and provided internet connectivity. Since the offer was in keeping with the original intent of the weather station installation, MLC agreed to sign the five year contract. The sensor and antennas arrived in May 2014 and installation occurred later in the month. After testing, the data was added to the network in June 2014. 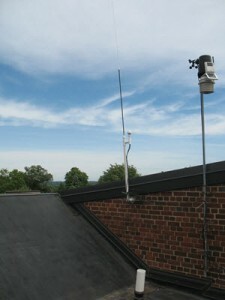 The photo here is of the stroke (whip) antenna along with the GPS antenna at MLC. The larger unit to the right is the Davis instruments weather center which provides the other weather data on the MLC weather page.